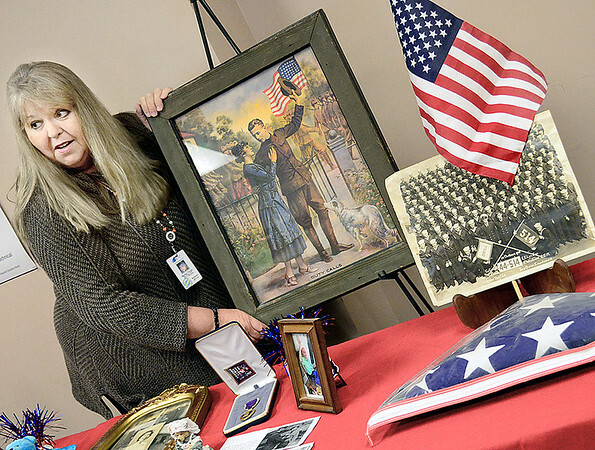 McAlester Kiamichi Technology Center Health Careers Certifications instructor Marilyn Turvey, LPN, prepares her familys exhibit in the KTC War Museum. The museum will be open to the public through Thursday 16th. Health Cart Certification and Medical Assisting students and KTC staff are displaying items such as old photos, medals and memorbilia from veterans past and present who have a connection with the McAlester KTC campus through students or staff. Along with the museum, Kathy Scifres came up with an idea to send postcards from KTC students to veterans, nearly 200 postcards where mailed out to veterans who's addresses where provided by KTC students.